The Baltic Sea is a semi-enclosed inland sea located in Northern Europe. Considered an arm of the Atlantic Ocean, it is connected to it via the Kattegat Strait, Skagerrak Strait, and the North Sea. It extends northward from southern Denmark to within a few degrees latitude of the Arctic Circle separating the Scandinavian Peninsula from continental Europe. Similar to the Black Sea, the Baltic is one of the most brackish bodies of water in the world, receiving both ocean and river water. Its ecosystem makes it a favorite of scientists and researchers, because it responds relatively quickly to external influences. Natural occurrences, such as environmental factor fluctuations, and anthropogenic effects, such as fisheries, pollution, or industrialization impact the sea measurably. The Baltic Sea's strategic position made central to the Hanseatic League, an alliance of trading guilds that established and maintained a trade monopoly during the Late Middle Ages and early modern period. In the twentieth century, concern for the region's environment prompted international cooperation and the formation of the Helsinki Commission. The commission is the governing body of the Helsinki Convention on the Protection of the Marine Environment of the Baltic Sea Area, which serves to protect the unique natural environment of the entire Baltic Sea region. 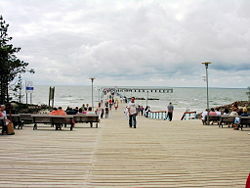 Bridge into the sea in Palanga, the most popular sea resort in Lithuania. Phytoplankton bloom in the Baltic Proper, July 3, 2001. The northern part of the Baltic Sea is known as the Gulf of Bothnia, of which the northernmost part is the Bothnian Bay. The more rounded southern basin of the gulf is called Bothnian Sea and immediately to the south of it lies the Sea of Åland. The Gulf of Finland connects the Baltic Sea with Saint Petersburg. The Gulf of Riga lies between the Latvian capital city of Riga and the Estonian island of Saaremaa. In the south, the Bay of Gdańsk lies east of the Hel peninsula on the Polish coast and west of Sambia in Kaliningrad Oblast. The Bay of Pomerania lies north of the islands of Usedom and Wolin, east of Rügen. Between Falster and the German coast lie the Bay of Mecklenburg and Bay of Lübeck. The westernmost part of the Baltic Sea is the Bay of Kiel. The three Danish straits, the Great Belt, the Little Belt and The Sound (Ö/Øresund), connect the Baltic Sea with the Kattegat bay and Skagerrak strait in the North Sea. The confluence of these two seas at Skagen on the northern tip of Denmark is a visual spectacle visited by many tourists each year. The Baltic Sea drainage basin is roughly four times the surface area of the sea itself. About 48 percent of the region is forested, with Sweden and Finland containing the majority of the forest, especially around the Gulfs of Bothnia and Finland. About 20 percent of the land is used for agriculture and pasture, mainly in Poland and around the edge of the Baltic Proper, in Germany, Denmark and Sweden. About 17 percent of the basin is unused open land with another 8 percent of wetlands. Most of the latter are in the Gulfs of Bothnia and Finland. The rest of the land is heavily populated. Approximately 100,000 km² of the Baltic's seafloor (a quarter of its total area) is a variable dead zone. The more saline (and therefore denser) water remains on the bottom, isolating it from surface waters and the atmosphere. This leads to decreased oxygen concentrations within the zone. It is mainly bacteria that grow in it, digesting organic material and releasing hydrogen sulfide. Because of this large anaerobic zone, the seafloor ecology differs from that of the neighboring Atlantic. The low salinity of the Baltic sea has led to the evolution of many slightly divergent species, such as the Baltic Sea herring, which is a smaller variant of the Atlantic herring. The benthic fauna consists mainly of Monoporeia affinis, which is originally a freshwater species. The lack of tides has affected the marine species as compared with the Atlantic. About 85 million people live in the Baltic drainage basin, 15 million within 10 km of the coast and 29 million within 50 km of the coast. Around 22 million live in population centers of over 250,000 each. Of the nations containing all or part of the basin, Poland includes 45 percent of the 85 million, Russia 12 percent, Sweden 10 percent and the remainder have less than 6 percent each. Population density in the wider Baltic region. The largest (by population) coastal cities include: Saint Petersburg, Russia; Stockholm, Sweden; Copenhagen Denmark; Helsinki, Finland; Gdańsk Poland; Riga, Latvia; Szczecin Poland; Tallinn Estonia; and Kaliningrad Russia. The Baltic Sea somewhat resembles a riverbed, with two tributaries, the Gulf of Finland and Gulf of Bothnia. Geological surveys show that before the Pleistocene instead of the Baltic Sea, there was a wide plain around a large river called the Eridanos. Several glaciation episodes during the Pleistocene scooped out the river bed into the sea basin. By the time of the last, or Eemian Stage (MIS 5e), the Eemian sea was in place. From that time the waters underwent a geologic history summarized under the names listed below. Many of the stages are named after marine animals (such as the Littorina mollusk) that are clear markers of changing water temperatures and salinity. The factors that determined the sea’s characteristics were the submergence or emergence of the region due to the weight of ice and subsequent isostatic readjustment, and the connecting channels it found to the North Sea-Atlantic, either through the straits of Denmark or at what are now the large lakes of Sweden, and the White Sea-Arctic Sea. The Baltic Sea is the second largest brackish water basin in the world in terms of water volume. It occupies a basin formed by glacial erosion and is a mixture of ocean water and fresh water brought by numerous rivers. The Baltic Sea is about 1600 km (1,000 mi) long, an average of 193 km (120 mi) wide, and an average of 55 m (180 ft, 30 fathoms) deep. The surface area is about 386,000 km² (149,000 sq mi) and the volume is about 21,000 km³ (5040 cubic miles). The periphery amounts to about 8000 km (4968 mi) of coastline. The deepest area of the sea is found off the southeast coast of Sweden, where it measures a depth of 459 meters (1,506 ft). Its shallowest area is the continental shelf, in the area of the Danish archipelago. As a long-term average the Baltic Sea is ice covered for about 45 percent of its surface area at maximum annually. The ice-covered area during such a typical winter includes the Gulf of Bothnia, the Gulf of Finland, Gulf of Riga and Väinameri in the Estonian archipelago. The remainder of the Baltic itself does not freeze during a normal winter, with the exception of sheltered bays and shallow lagoons such as the Curonian Lagoon. The ice reaches its maximum extent in February or March; typical ice thickness in the northernmost areas in the Bothnian Bay, the northern basin of the Gulf of Bothnia, is about 70 cm for landfast sea ice. The thickness decreases further south. Freezing begins in the northern coast of Gulf of Bothnia typically in middle of November, reaching the open waters of Bothnian Bay in early January. The Bothnian Sea, the basin south of it, freezes on average in late February. 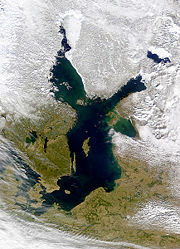 The Gulf of Finland and the Gulf of Riga freeze typically in late January. Severe winters can lead to ice formation around Denmark and southern Sweden, and on rare occasions the whole sea is frozen, such as in 1942 and 1966. In 1987, some 96 percent of the Baltic Sea was ice-covered, leaving only a small patch of open water in the southwest around Bornholm. However, in milder winters only restricted parts of the Bay of Bothnia and Gulf of Finland are ice covered, in addition to coastal fringes in more southerly locations such as the Gulf of Riga. In recent years a typical winter produces only ice in the northern and eastern extremities of the Sea. In 2007 there was almost no ice formation except for a short period in March. In spring, the Gulf of Finland and of Bothnia normally thaw during late April, with some ice ridges persisting until May in the eastern Gulf of Finland. In the northernmost reaches of the Bothnian Bay ice usually stays until late May; by early June it is normally gone. During winter, fast ice which is attached to the shoreline, develops first, rendering the ports unusable without the services of icebreakers. Level ice, ice sludge, pancake ice or rafter ice form in the more open regions. The gleaming expanse of ice is similar to the Arctic, with wind-driven pack ice and ridges up to 15 m, and was noted by the ancients. Offshore of the landfast ice, the ice remains very dynamic all year due to its thickness. It is relatively easily moved around by winds and therefore creates large ridges which abut against the landfast ice and shores. The ice cover is the main habitat only for a few larger species. The largest of them are the seals that both feed and breed on the ice, although the sea ice also harbors several species of algae that live in the bottom and inside brine pockets in the ice. The Baltic Sea flows out through the Danish straits; however, the flow is complex. A surface layer of brackish water discharges 940 km³ per year into the North Sea. Due to the difference in salinity, a sub-surface layer of more saline water moving in the opposite direction brings in 475 km³ per year. It mixes very slowly with the upper waters, resulting in a salinity gradient from top to bottom, with most of the salt water remaining below 40 to 70 m deep. The general circulation is counter-clockwise: northwards along its eastern boundary, and south along the western one. The difference between the outflow and the inflow comes entirely from fresh water. More than 250 streams drain a basin of about 1.6 million km², contributing a volume of 660 km³ per year to the Baltic. They include the major rivers of northern Europe, such as the Oder, the Vistula, the Neman, the Daugava and the Neva. Some of this water is polluted. Additional fresh water comes from the difference of precipitation less evaporation, which is positive. An important source of salty water are infrequent inflows of North Sea water into the Baltic. Such inflows, important to the Baltic ecosystem because of the oxygen they transport into the Baltic deeps, once happened on average every four to five years until the 1980s. In recent decades they have become less frequent. The latest three occurred in 1983, 1993 and 2003 suggesting a new inter-inflow period of about ten years. The significant wave height is generally much lower than that of the North Sea. Violent and sudden storms often sweep the surface, due to large transient temperature differences and a long reach of wind. Seasonal winds also cause small changes in sea level, of the order of 0.5 m (Alhonen 88). The Baltic Sea's salinity is much lower than that of ocean water (which averages 3.5 percent, or 35 parts per thousand), as a result of abundant freshwater runoff from the surrounding land; indeed, runoff contributes roughly one-fortieth its total volume per year, as the volume of the basin is about 21,000 km³ and yearly runoff is about 500 km³. The open surface waters of the central basin have salinity of 6 to 8 ‰ (parts per thousand). At the semienclosed bays with major freshwater inflows, such as head of Finnish Gulf with Neva mouth and head of Bothnian gulf with close mouths of Lule, Tornio and Kemi, the salinity is considerably lower. Below 40 to 70 m, the salinity is between 10 and 15 ‰ in the open Baltic Sea, and more than this near Danish Straits. The flow of fresh water into the sea from approximately two hundred rivers and the introduction of salt from the south builds up a gradient of salinity in the Sea. Near the Danish straits the salinity is near that of the Kattegat, but still not fully oceanic, because the saltiest water that passes the straits is still already mixed with considerable amounts of outflow water. The salinity steadily decreases towards north and east. At the northern part of the Gulf of Bothnia the water is no longer salty and many fresh water species live in the sea. The salinity gradient is paralleled by a temperature gradient. These two factors limit many species of animals and plants to a relatively narrow region of Baltic Sea. The land is still emerging isostatically from its subsident state, which was caused by the weight of the last glaciation. The phenomenon is known as post-glacial rebound. Consequently, the surface area and the depth of the sea are diminishing. The uplift is about eight millimeters per year on the Finnish coast of the northernmost Gulf of Bothnia. 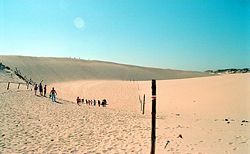 In the area, the former seabed is only gently sloped, leading to large areas of land being reclaimed in, geologically speaking, relatively short periods (decades and centuries). In the early Middle Ages, Vikings of Scandinavia built their trade emporia all around the Baltic. Later, there were fights for control over the sea with Wendish tribes dwelling on the southern shore. The Vikings also used the rivers of Russia for trade routes, finding their way eventually to the Black Sea and southern Russia. This Viking-dominated period is also referred to as Viking Age. Starting in the eleventh century, the southern and eastern shores of the Baltic were settled by Germans (and to a lesser extent by Dutch, Danes and Scots) in the course of the Ostsiedlung. Denmark gradually gained control over most of the Baltic coast, until she lost much of her possessions after being defeated in the 1227 Battle of Bornhöved. Lands next to the sea's eastern shore were among the last in Europe to be converted to Christianity in the Northern Crusades: Finland in the twelfth century by the Swedes, and what are now Estonia and Latvia in the early thirteenth century by the Danes and the Germans (Livonian Brothers of the Sword). The Teutonic Knights gained control over parts of the southern and eastern shore of the Baltic Sea, where they set up their monastic state while fighting the Poles, the Danes, the Swedes, the Russians of ancient Novgorod, and the Lithuanians (last Europeans to convert to Christianity). In the thirteenth to seventeenth centuries, the strongest economic force in Northern Europe became the Hanseatic League, which used the Baltic Sea to establish trade routes between its member cities. In the sixteenth and early seventeenth centuries, Polish-Lithuanian Commonwealth, Denmark and Sweden fought wars for dominion. Eventually, it was the Swedish Empire that virtually encompassed the Baltic Sea. 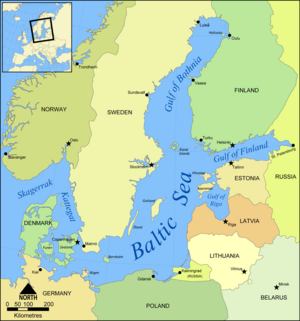 In Sweden the sea was then referred to as Mare Nostrum Balticum ("Our Baltic Sea"). In the eighteenth century, Russia and Prussia became the leading powers over the sea. The Great Northern War, ending with Sweden's defeat, brought Russia to the eastern coast. Russia's Peter the Great saw the strategic importance of the Baltic and decided to found his new capital, Saint Petersburg at the mouth of the Neva river at the east end of the Gulf of Finland. Trading developed not just within the Baltic region but also with the North Sea region, especially eastern England and the Netherlands. During the Crimean War, a joint British and French fleet attacked the Russian fortresses by bombarding Sveaborg, which guards Helsinki; Kronstadt, which guards Saint Petersburg; and by destroying Bomarsund in the Åland Islands. After the unification of Germany in 1871, the whole southern coast became German. The First World War was partly fought in the Baltic Sea. After 1920 Poland was connected to the Baltic Sea by the Polish Corridor and enlarged the port of Gdynia in rivalry with the port of the Free City of Danzig (now Gdansk). During the Second World War, Nazi Germany reclaimed all of the southern shore and much of the eastern by occupying Poland and the Baltic States. In the frigid waters of January 1945, the Baltic Sea became a mass grave for drowned people on torpedoed refugee ships. As of 2004, the sinking of the Wilhelm Gustloff remains the worst maritime disaster, killing an estimated 6000 people, mostly women and children, and about 1200 wounded German soldiers. In 2005, a Russian group of scientists found over five thousand airplane wrecks, sunken warships, and other materiel mainly from the Second World War, lying at the bottom of the sea. After 1945, the German population was expelled from all areas east of the Oder-Neisse line, making room for Polish and Russian settlers. Poland gained a vast stretch of the southern shore, Russia gained another access to the Baltic with the Kaliningrad oblast. The Baltic states on the eastern shore were again incorporated in the Soviet Union, Poland and East Germany became communist states. The sea then was a border between opposing military blocs: in the case of military conflict, in parallel with a Soviet offensive toward the Atlantic Ocean, communist Poland's fleet was prepared to invade the Danish isles. This border status also impacted trade and travel, and came to an end only after the collapse of the communist regimes in Eastern and Central Europe in the late 1980s. While being a major route for navigation, the sea also provides amber, especially from its southern shores. The bordering countries have traditionally provided lumber, wood tar, flax, hemp, and furs. Sweden had from early medieval times also a flourishing mining industry, especially on iron ore and silver. Poland had and still has extensive salt mines. All this has provided for rich trading since the Roman times. In the 1950s, environmental scientists in the Baltic region began to note negative effects of large-scale industrial development and chemical runoffs from agriculture. Effluence from pulp mills was especially damaging with high nitrogen release from nitrates in papermaking. Concern over threats to the region's plant and animal life enabled cooperation between the region's countries. Beaches were no longer safe for swimming. Cooperation over environmental issues led to the 1974 signing by Baltic countries of the Helsinki Convention on the Protection of the Marine Environment of the Baltic Sea Area. Although the agreement was signed in 1974, due to political wrangling and consensus building, it was enacted on May 3, 1980. Political changes and developments in environmental and maritime law caused a new convention to be signed in 1992. All the states bordering on the Baltic Sea, and the European Community joined in the agreement. The 1992 Convention covers the entire Baltic Sea region, including all the inland waters, the Baltic Sea's water and its seabed. Measures were also taken in the whole catchment area of the Baltic Sea to reduce land-based pollution. The revised Convention on the Protection of the Marine Environment of the Baltic Sea Area became enforceable on January 17, 2000. This was one of the first international attempts to control land-based sources of pollution in a shared marine environment. Determination of its effectiveness continues to develop, with emphasis upon sustained development. The governing body of the Convention is the Helsinki Commission. (HELCOM)  The contracting parties are the European Community, Denmark, Germany, Poland, Lithuania, Latvia, Estonia, Russia, Finland, and Sweden. ↑ The Baltic Sea Portal. General Information: Characteristics of the Baltic Sea Retrieved November 20, 2008. ↑ Space Science and Engineering Centre, University of Wisconsin. Sea Ice survey Retrieved November 20, 2008. ↑ Jan Thulin and Andris Andrushaitis. 2003. The Baltic Sea: Its Past, Present and Future Religion, Science and the Environment Symposium V on the Baltic Sea. Retrieved November 20, 2008. ↑ Irwin J. Kappes, [http://www.militaryhistoryonline.com/wwii/articles/wilhelmgustloff.aspx' "Wilhelm Gustloff - The Greatest Marine Disaster in History". Military History Online. Retrieved November 25, 2008. ↑ Helsinki Commission. Baltic Marine Environment Protection Commission Overview Baltic Sea Action Plan (in English) Retrieved November 20, 2008. Alhonen, Pentti. 1971. The stages of the Baltic Sea as indicated by the diatom stratigraphy. Acta botanica Fennica, 92. Helsinki: Societas pro fauna et flora Fennica. Fairbridge, Rhodes W. 1966. The encyclopedia of oceanography. Encyclopedia of earth sciences series, v. 1. New York: Reinhold Pub. Co.
Helsinki Commision. Baltic Marine Environment Protection Commission Retrieved November 20, 2008. Baltice.org - information related to winter navigation in the Baltic Sea. This page was last modified on 10 May 2016, at 16:40.